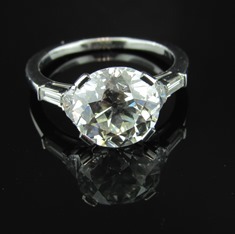 Continue to step into historic eras with this platinum old European cut diamond ring. This particular piece of art features an immense amount of detail including engraved shapes and swirls that truly represent the time period. A stunning piece from the Art Deco period. It features three beautiful diamonds in a shiny platinum setting. The total diamond weight is 3.55TCW. 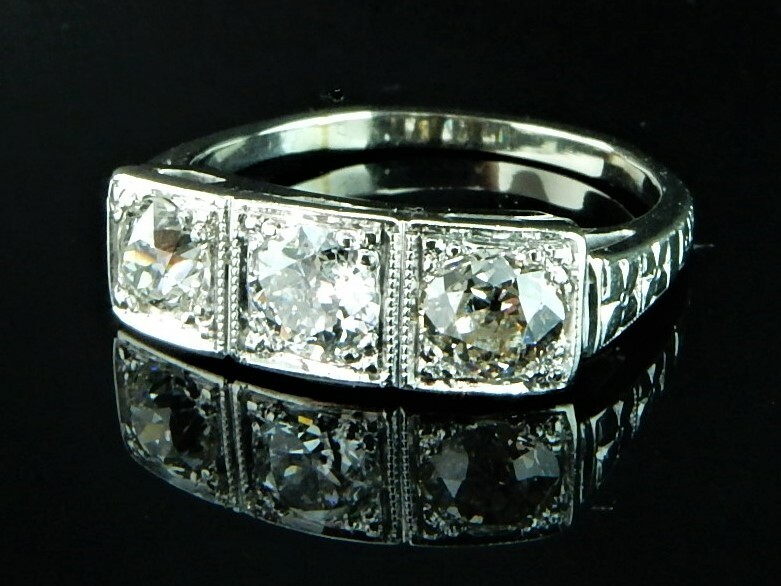 This is a sparkling diamond set ring. The colorless and high clarity diamonds work together to create a very special design. 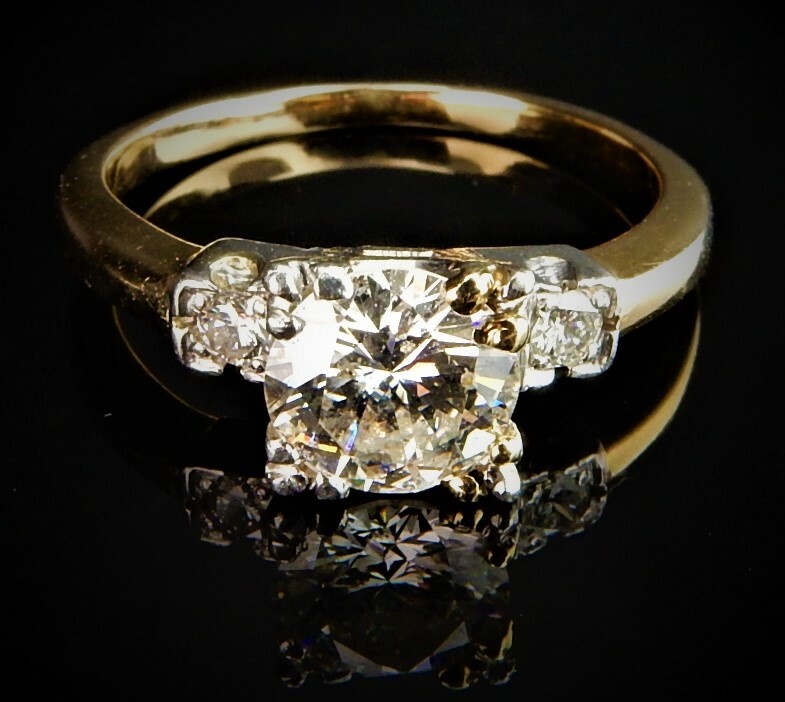 This is a wonderful .83ct round brilliant center stone with 14K gold setting. The beautiful center stone is surrounded by two .10ct set diamonds that create such a stunning and classic design. 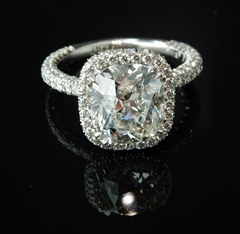 PLATINUM 1 CUSHION DIAMOND RING WITH MICROSET DIAMONDS. 3.02CTW CENTER STONE AND 150 SURROUNDING DIAMONDS EQUALING 1.50CTW. GIA#11311172. H- VVS2. Platinum 4.79ctw diamond 1/2 moon and baguette side diamond engagement ring. 1 Old European cut 4.34ct center stone, J color, VS2 clarity. GIA certified. 5 half-moon and baguette side diamonds totaling .45ctw. Amazing quality, simply stunning. Estate. 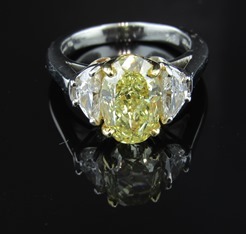 Platinum & 18K 3.93ctw natural fancy yellow diamond ring. 3.20ct fancy yellow oval shaped diamond is surrounded by two half moon shaped diamonds totaling .73ctw. A jaw-dropping piece. Estate. 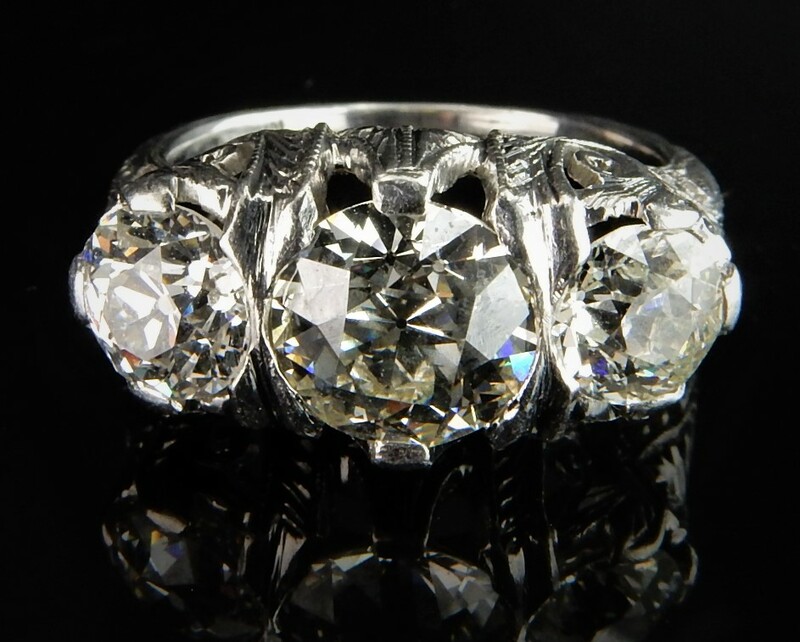 Spectacular Platinum GIA certified 4.79ctw old-European cut diamond ring. 1/2 moon diamond and baguette side diamonds. 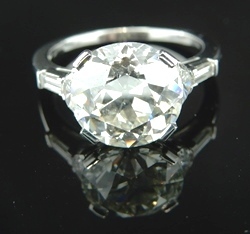 4.34ct, VS2 clarity old-euro cut center diamond. 5 diamonds total. Estate. 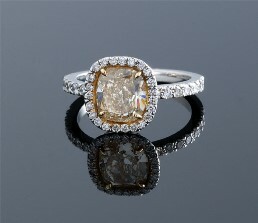 Platinum & 18K 2.53ctw Cushion Cut Natural Yellow Diamond Ring in a brilliant micro-pave setting. Natural Yellow Diamond=2.00cts + surrounding white diamonds=0.53cts. 10.5 x 10.5mm. Estate. 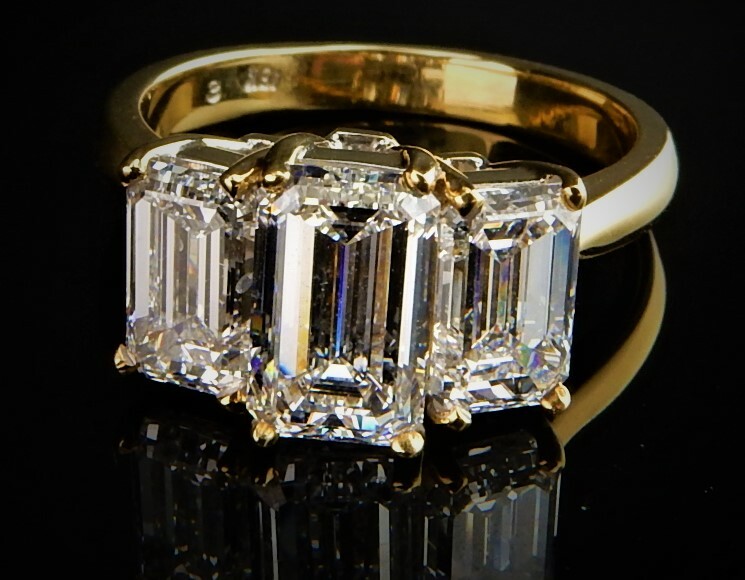 14kw three stone engagement ring. center diamond is .32cts, H color, SI1 clarity. Two side diamonds have a combined weight of .38ctw, H color, SI1 clarity as well. .70ctw. 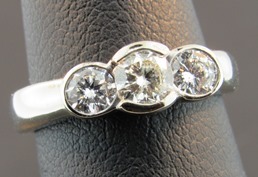 Bezel set for comfort and safety of your diamonds. Estate. 1930's Platinum 1.19ctw diamond wedding set. Platinum 1930'S wedding set. Fused together. 1.19CTW. 1 round diamond in the center- H/J- SI1= .79CT. GIA certified. 12 round diamonds = .40CTS. 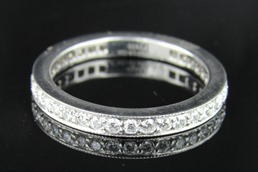 Platinum Tiffany & Co .80ctw diamond eternity band. 39 round brilliant diamonds surround the band. VS clarity, E/F color.